Green, wide, fully deprivate from direct sunlight - the forest. This is the main place where the hunters of the Moon clan stalk and catch their prey. The place is full of game. 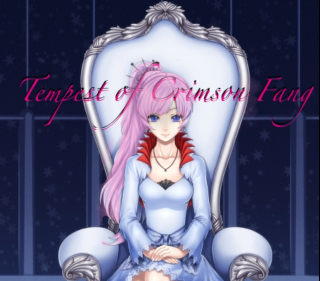 This is the a continuation of the forest in the territory of Crimson Fang. Unlike their part, this one if often foggy and the trees are innumerable, which is an advantage to the wolves. Except for hunting, the members of the Moon clan often come here to relax and play. 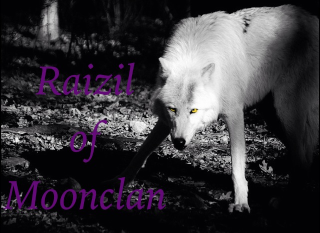 Raizil arrived at the hunting grounds or her clan. She was panting from her run, she found a nice spot under a tree to lay under. She laid down and as she regained control over her wolf, she started thinking out what she just did. She just let every male wolf in the forest know that she was seeking out a strong mate. Even though she has a mate already, but technically by ancient standards her and Jake wouldn't be considered mates unless they completed the mate bond which they haven't done. The mate bond is where they would be able to feel what the other was feeling and to hear their thoughts. It is completed where when each mate bites the other and shares their blood. Rai didn't know how she would be able to face Jake, she knew that she had just broken his heart. And she wanted to run back and tell him that it was all just a mistake, but she knew that she did need a mate that could be her equal. Jake is a fighter, so yeah he is strong but that is as far as his power goes. She needed somebody who could lead the clan in her absence. So making her final decision she raised her head again and called out to a powerful mate, this time fully in control of herself. Jake pounded into forest with heavy footprints that left imprints in the ground. His eyes were flared with rage and his fur bristled. He followed her second with added rage and hate. This one wasn't wolf fueled, he heard it. Soon he found her under a tree. He didn't talk, he didn't growl, he didn't roar. No, instead he silent charged at her and tackled her, sinking his fangs into her shoulder. He growled into her ear with rage and hate, and his normally green eyes were burning with fiery fury. Raizil howled in pain as Jake's fangs sank into her shoulder. She shook him off of her and kicked him in the side. She then barred her fangs at him and gave him a lip curling snarl, signaling to back off. Her ice magic simmered around her, waiting. Raizil knew that she needed to calm him down so they could talk. "Shift!" she said in her alpha voice. Jake yelped as he was kicked off, but quickly regained footing. His snarled right back at her, and a lighting bolt struck down between them. The air around him crackled with electricity, and the black wolfs green eyes were furious. "No!" He growled and lunged again. Raizil jumped back as the lighting came down between them. When Jake told her no and with the combination of his rage, the little bit of the bond she had created with Jake was broken. She whimpered at the lost of her former mate. But then she had her ice fully surround her, "Jake don't do this, I don't want to fight you. I still care for you, but I need somebody to be my equal. I'm only following my instincts. it's nothing against you, you are a wonderful guy. And you will always be Kenji's father, nobody can take that right from you, not even me." In good faith, Rai released her ice power and waited. Jake roared angrily. "I love you Raizil! I love you! I always will! Even if you die or I die I will!i won't let any other male recieve your love or let there be a chance of Kenji seeing another male as his father!" He growled. Suddenly he shook his head. "Let me guess? You are going to run back to Casper, someone of your equal! Well fine, you won't be the only one! I'm going to Crimson fang to either kill him or die myself!" He roared. Suddenly he twisted around and took off towards the border. Raizil smiled at Jake's loyalty to her and her son. But as he went on talking her face turned from a smile to that of horror. She yelled after him, "Wait Jake No! Jake come back!" But he didn't hear her, she ran after him. She knew that if he crossed that border, they would kill him.